Amazon wants an army of couriers it can control without having the risks and costs associated with hiring them. Introducing the Delivery Service Partner program (DSP), where Amazon will train people to operate their own delivery businesses but with a crucial difference: they'll be limited to delivering Amazon packages only. Amazon starts off DSPs with five routes/day and monitors their performance. "Successful owners add five additional routes in their 5th, 9th, and 11th week, bringing their business to 20 or more routes after three months." What happens if they have a bad week due to circumstances outside their control? It's easy to see how this could happen: vans break down, employees quit or don't meet their performance standards, auto accidents occur - the list goes on. Amazon could reduce the DSP's routes, presumably with or without cause. 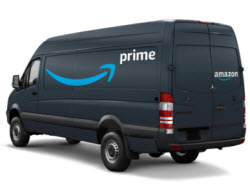 It seems unlikely Amazon will guarantee the number of routes it will provide DSPs, and the revenue figures it quotes in its brochure are based on a fleet size of between 20 - 40 vans (that would require a sizable number of employees). "As a result, a delivery company may not achieve the revenue figures in the range until it operates a fleet size of 20 to 40 vans for a full year, if ever." *Figures are projections for owners operating with 20 to 40 vans. Amazon said over time, it would empower hundreds of new small business owners to hire tens of thousands of delivery drivers across the US. The announcement comes a week after the White House announced its inclination to privatize the US Postal Service. Amazon is increasingly building out its own logistics to ensure it can deliver orders to customers, and while that's good for sellers who use its FBA program, it does nothing to help merchants and retailers who don't sell through the Amazon platform. You can find more information about the program on Logistics.amazon.com. The big loser is going to be the post office. I said before the USPS cut a sweet deal with Amazon. Probably already spent the money and looking for more. Now Amazon is making plans to drop the USPS like a piece of garbage. And all the while Ebay is sinking further into nothingness. The sinking ship keeps springing more leaks and will soon run out of bubble gum to stop them. This is why a Wall Street-created monopoly is so bad. It turns people into slaves. Yet the American public keeps helping Amazon and Wall Street tie the nooses that will eventually result in consumer slavery too lol. They bought the hype that Wall Street sold them in Wall Street-owned media and Google CEO complicity. Instead of demanding that legislators break down the monopoly that will destroy so many. It will eventually be too late. So they expect me to operate a fleet of 20-40 trucks for a possible low and profit of 75K a year? With no guarantee of volume? They can't possibly be serious... what idiot would be willing to do that? A re working of The Ho's newspaper truck joke. What we have here is another corporate scheme to avoid paying salaries and benefits to employees -- a concept that Wall Street also adores to the detriment of most. Not sure who would fall for this. If I had "as little as" $10K earmarked for a business, I could come up with much better than this scam. $10K would've bought the prototypes I needed to run an action figure Kickstarter at the very least. If I had _real_ money, Amazon wouldn't be on my radar at all. They must really be smoking some strong stuff over there in Seattle. Return of 75 - 300 thousand on an investment in 20 to 40 vehicles, the drivers to operate them and the people to maintain? That sounds like a nightmare franchise. One that is in all stsndards and practices still very much controlled by amazon in every respect. Your success is determined by what amazon throws your way. No small person will do this so small business isnt the word here. Most likely..it will be picked up by corporations snd eventually will have sole ownership of the franchise ss it strikes a deal with amazon. I'd be really cautious when considering taking a contract like this. 1. It's fishy that Amazon doesn't do this themselves. Unless they're skirting monopoly laws. If they knew there's money to be made, they'd do it themselves. There's a common practice in small business, where everyone undercuts everyone and it's a race to the bottom. Companies like Amazon exploit this, by paying out so little the contractor's will collapse and Amazon squeezes that money and generates profit in their own system. This is why Amazon's once-popular local courier services transformed into the Uber-style deliveries. 2. If it's anything like FBA (as of today their radical new rules are in effect, eliminating a huge portion of FBA sellers). Or the Ebay heartache we've all experienced ... you wouldn't want anything to do with this kind of deal. You could end up investing your time and money, and lose it all when they decide to change metrics or reform their business plan. It's really hard to trust companies like Amazon or Ebay as business partners. They're not. They'll bend you to their will from their unenlightened and inexperienced vantage point. And then remind you that you mean nothing to them. I had to go look up revenue vs profit just to make sure: Profit is always financial benefit while revenue is the amount of money generated through business activities before expenditures are subtracted to arrive at profit figure. Like Ebay, this is all experimental. If anything this delivery service will compete against Fedex Ground, which is independently owned and operates like a franchise. I think it cost $50K to buy in. There are too many unanswereds: Like, what happens if a package isn't delivered on time? Who gets called on the carpet if a pkg is late? You have to read the fine print of the contract, which will probably be 20 pages long. Own a business where you are only are allowed one customer? Sounds like a really bad idea .